LAS VEGAS (April 23, 2013)– XYIENCE Xenergy, the official energy drink of the UFC®, has signed a one-year endorsement contract with Ronda Rousey, the UFC women’s bantamweight champion. Rousey, 26, is an Olympic bronze medalist in judo and is the first woman in history to hold and defend a UFC title. Endorsing the superior tasting, sugar-free, zero calorie Xyience Xenergy energy drink and Xenergy + beverage lines, Rousey will appear in advertising, on point-of-purchase materials and on the brand’s website. She will also make appearances at beverage trade and consumer events. Rousey (7-0-0) is a two-time Olympian in judo. She made history in November 2012 when the UFC announced the former Strikeforce bantamweight champion-turned-UFC champion would headline UFC® 157: Rousey vs. Carmouche on February 23, 2013 in Anaheim, Calif. Rousey defended her title, and since then the California native has shot even further to stardom. 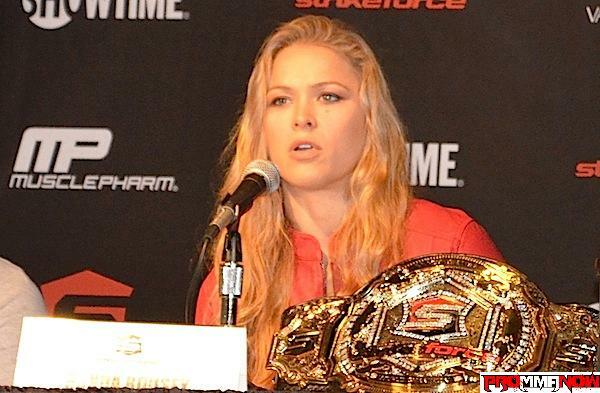 Rousey was named Female Fighter of the Year at the World MMA Awards earlier this year. She is the No. 1 pound-for-pound female MMA fighter in the world, according to leading industry publications and the Unified Women’s MMA Ranking, which is determined monthly by a panel of MMA journalists and is acknowledged as the only official women’s ranking in the sport. She transcends the sport of MMA, having been featured on the cover of ESPN Magazine’s Body Issue and in Sports Illustrated, Vogue Magazine, Esquire and the New York Times Magazine. Rousey is most often recognized for her stunning looks, outspoken nature and athletic accolades, which include a string of historic firsts. At the 2008 Olympic Games in Beijing, Rousey took home a bronze medal for Team USA, becoming the first American to medal in women’s judo since it became an Olympic sport in 1992. In 2006, she won the bronze medal at the Junior World Championships, making her the first U.S. athlete to win two Junior World medals. At the 2004 Olympic Games in Athens, 17-year-old Rousey was the youngest judo competitor at the games.